Richard Murphy was born in 1927 in Co. Mayo, the son of an officer in colonial service in Sri Lanka (then Ceylon) and later Governor of the Bahamas. He received a scholarship to Oxford, where C. S. Lewis was his tutor. Having lived for many years in Connemara, he now divides his time between Dublin and Durban, South Africa. 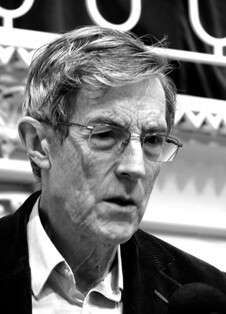 Richard Murphy’s many volumes of poetry include The Archaeology of Love (1955); Sailing to an Ireland (1955, 1963, 1968); The Battle of Aughrim and The God Who Eats Corn (1968); Selected Poems (1979); The Price of Stone and Earlier Poems (1985); New Selected Poems (1989); The Mirror Wall (1989); and Collected Poems (2000). His poetry has also been collected in several anthologies. His memoir, The Kick, was published in 2001. A member of Aosdána and of the Royal Society of Literature, he has received numerous literary awards, including the British Arts Council Award, the Marten Toonder Award, and the American Irish Foundation Literary Award. Murphy died on January 20, 2018, at the age of 90.